The first of many planned IMAX theaters dedicated to virtual reality has opened in Los Angeles. Trading large, wraparound screens for small, immersive headsets, the facility allows anyone to experience VR without buying a high-end gaming PC or video game console. As UploadVR reports, the LA center has a mixture of HTC Vive and Starbreeze StarVR headsets. They're stored in 14 isolated "pods" which also contain a Dbox cinema chair, a vibration-emitting Subpac vest and a variety of physical controllers. You can buy experiences individually, such as John Wick Chronicles, or grab a "sampler" if you want a broader taste of VR. 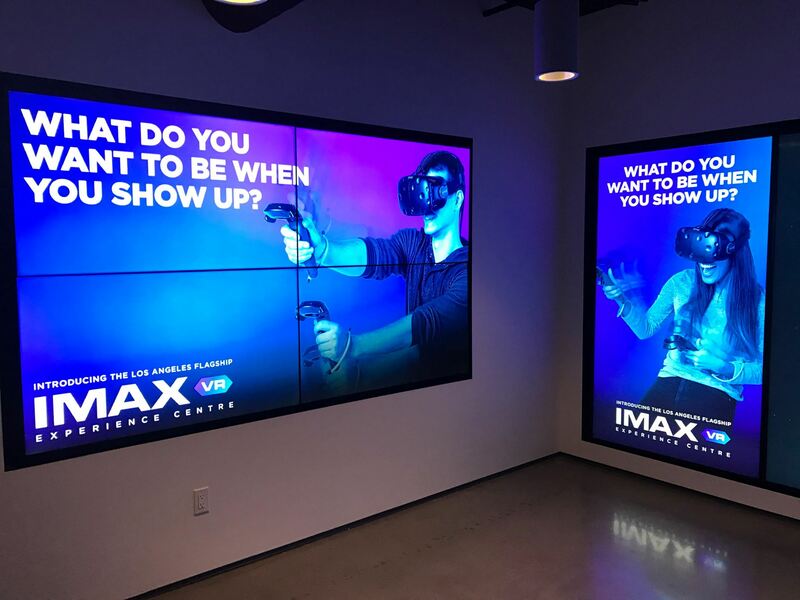 IMAX has been teasing its VR centers for almost a year now. Since then, we've seen other cinema chains, such as MK2 in Paris, construct similar installations dedicated to virtual immersion. The idea is simple: most people have never tried the Oculus Rift or HTC Vive, due to a lack of funds or space in their living room. There's also a group of people who just want to try the occasional experience -- if you're a climbing fan, for instance, you might want to play Sólfar Studios' Everest VR, but little else. With IMAX VR, you can now access these experiences on a pay-as-you-go basis. At launch, IMAX has a mixture of immersive games and movies including Star Wars: Trials on Tatooine, Eagle Flight and The Walk. To stand out, IMAX is also working on exclusive content. It's not ready just yet, but the company has raised $50 million to aid its development and the construction of additional VR centers. These are planned for New York, California, China and the UK. Before they're built, IMAX needs to prove that the business model works. While there's interest in VR, it's not clear how many people want to try and pay for the experience on a regular basis. Will be cool to learn about what people say about this place. Having a brand like IMAX that could help people learn more about VR. Also a virtual tour around the place. I REALLY want to go here, but LA is very far from me. I think for a short period of time centers like this open will appear here and there, mostly there than here, so eventually you will see one close to you. Hello neerajedwards welcome to the VR Heads Forum! What brings you to the world of VR? Any caught your interests? Take the time peruse the forums and most importantly, enjoy! HTC Mobile VR headset is on the way!